Our beautiful 3 bedroom, 2 bath condominium is the corner unit in Chateau Chaumont. We are on the top floor of a 3 story, well maintained building with 24 units, that has a great community. Our unit is sunny, has high ceilings, has spectacular views of Aspen mountain and is just steps away from everything in Aspen! Our condominium is beautifully appointed inside, but the real amenity is it's location. We are literally 1 1/2 blocks from Aspen mountain's Silver Queen gondola, and the City Market grocery store and the Grog Shop liquor store are right across the street. Chateau Chaumont is in downtown Aspen, across from the Sky Hotel (with a great Après ski bar and a public pool) and has a fabulous hot tub in the courtyard. Local RFTA buses are only 3 blocks away and offer free skier shuttles to Snowmass, Aspen Highlands and Buttermilk mountains. With as much that goes on in Aspen, it’s critical to be steps away! Our condominium was recently refurbished by an interior designer with new Crate and Barrel furniture, 2 deep leather couches, 2 new flat screen TV’s (Family room TV has a DVD player), WI-FI, a stereo with an iPod connection, Ralph Lauren bedding, wood-burning fireplace and a washer/dryer in the unit. The kitchen is fully stocked and condiments, spices and laundry detergent are provided. Our private porch has a table with chairs and a bench, and is the perfect sunny spot for breakfast or hors d' oeuvres and a glass of wine at the end of the day! The master bedroom, with an attached private bath, has a king size bed, a ceiling fan and a flat screen t.v. Both the 2nd and 3rd bedrooms have 2 twin beds in each room and ceiling fans. There is free parking in the garage and heated snow-melt spots in the alley. We are always updating our unit. Over the last three years, we updated the decorating, have added all new cozy posturpedic beds, installed a new Maytag washer, dryer and dishwasher, new windows (with new silhouette blinds) and freshly painted the front entry, kitchen and family room. Ceiling fans were added in the family room and all three bedroom and the association built a fabulous hot tub in the courtyard with strong jets. This truly is the good life, just steps away from everything! Avid skier, hiker, Mountain biker, golfer, rafter... and most other outdoor activities. Father to 3 wonderful daughters. 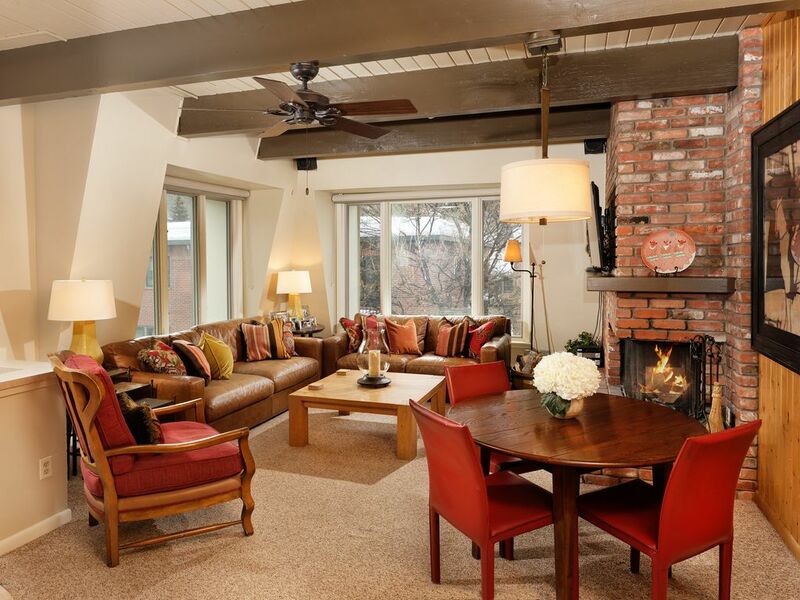 This well decorated/ comfortable condo's location is the best in Aspen. There are very few ski in/out condo's in Aspen. This is not one of them, but Its 1.5 blocks from the lift, in downtown Aspen with mountain views, is across the street from the grocery store, but is not on a bus route (i.e. no constant bus noise, but bus station is only 2.5 blocks away), AND you don't have too walk up a hill to get home! This is the good life. Well decorated, high end condominium with a great location! Aspen mtn Silver Queen gondola 1.5 blocks away. Flat walk. Easily done holding all the kids ski equipment. 2 leather couches and a large chair infront of a roaring woodturning fireplace are great for relaxing or napping after a long day of skiing or hiking. Spices, oils, sugar, condiments, vinegar, hot chocolate, syrup, dish soap and laundry detergent. Kitchen is fully stocked with all you need for cooking, including spices, oils, and condiments. Table can expand to seat 6. Balcony with table and chairs and a bench outside our front door are the best place for breakfast or cocktails. Outdoor table with chairs on the patio on the ground floor. Chairs on the 3rd floor deck are perfect for hors d'ouvres and cocktails in the afternoon sun. Next door, at the Sky Hotel, with an outdoor heated pool and jacuzzi. The owner can arrange additional condos to rent in our building for larger gatherings and can supply information for things to do, restaurants, a private chef and the delivery of food baskets. We stayed for 4 nights in February. While the bedrooms are small, the place was big enough for our group of 6, including 4 teenagers. The condo is very conveniently located, just a couple of blocks from the bus depot and the grocery store, as well as lots of restaurants and the Aspen gondola. The two bathrooms are recently renovated and really nice. The hot tub is large and at least one of us used it every night. The reprogrammable combination lock on the front door makes access very convenient, even if you arrive late the first night like we did. The owner is responsive and helpful. Highly recommended as a reasonably priced option in Aspen. We enjoyed our stay at this property in Aspen. It is super convenient (walking distance to everything!) and has everything you need in the condo - humidifiers, extra towels, all kitchen gear + paper towels, etc. Check in and out were super easy and the owner was great to communicate with. The only downside for us was the three flights of outdoor stairs necessary to access the condo (we were traveling with a baby). The stairs were shoveled off eventually when it snowed, but still rather slippery and precarious when carrying a child or a stroller. All that being said, I would recommend this property to other travelers, especially young adults with no babies or people with a difficult time with stairs. Cozy, comfortable, & what a location! We spent a week in this condo in Aspen and thoroughly enjoyed ourselves. The layout is ideal for one adult couple and 4 singles (kids, etc) with two beautiful, newly remodeled bathrooms, comfortable beds, and a well-equipped kitchen. The hot tub was a bonus. Convenient to all of Aspen, and a particularly easy walk to the Gondola. Only negative was the construction currently going on to south and west of the building. In fact, all of Aspen is bustling with major construction, so I'm guessing by this time next year there will be a lot of shiny new places around. We had an awesome vacation in Aspen! Condo was beautiful, location great, and owners were wonderful to work with. I just returned from a friends' ski trip to Aspen. This home was perfect - everything is as it appears in the photos. Beds are comfy, bathrooms are luxurious (with Molton Brown toiletries) with soft and plentiful towels, and the kitchen is well stocked for cooking. Washer and dryer look new and are very quiet. Location is fantastic with an easy walk to the Aspen Mountain gondola (even in ski boots), grocery store, or restaurants in town. Absolutely no need for a car, even if going to other mountains. Perfect location, just a block away from the gondola. The condo was centrally located and within walking distance of everything we needed. We did not rent a car because of the condo's convenient location and the free public transportation. The condo was cozy and comfortably appointed with great views of the mountain. Ski all 4 mountains- Aspen, Snowmass, Aspen Highlands and Buttermilk. Visit Aspen's website, for fabulous restaurants, local events and ski information. Also check out Aspen Institute, Belly Up (live music), St Regis Hotel's Spa, pilates at O2, cross country skiing, snowshoes or a sleigh ride to Pine Creek Cook House, evening ice cream at Paradise Bakery and the Anderson Ranch Art Center. Don't forget to get discounted ski ticket information from the owner! Please read the contract. You will be charged for damage, unknown pets, over 6 people, smoking, lost keys and lost parking pass. We have only charged for damage once, but $250 charge for lost keys happen more often than I like. Smoking pot in the complex has become an issue. If anyone smells pot smoke the association will immediately fine you $500.